Honestly, each time I come to your office, I feel like it’s a party. The valium and “nitrous” keep me happy and relatively stress (anxiety) free, and having Dr. Timm work on my teeth is like having my trusted little brother taking care of me. That, plus staff who make you feel like a million bucks. Who can ask for more? 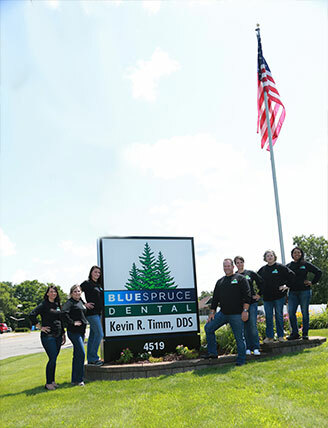 Everyone I come in contact with at Blue Spruce Dental is outstanding in what they do. The staff is very friendly and courteous while also being completely professional. The entire staff did a great job. I was impressed with the computer diagrams of my teeth and the areas that needed work. It made understanding my problems and the care much easier than just talking about it. I had been going to Dr. Timm then lost my insurance. I moved so I went to someone closer. Big mistake. I decided to go back to Dr. Timm. His office staff helped to make arrangements for what I needed done. His dental assistant made me feel very comfortable. I have never liked the dentist, so if you are afraid... you should go to Dr. Timm. His whole staff will make you feel comfortable. They are awesome! Thank you.